The holiday is over, the food has been eaten, and I feel like I need to detox. Every year I vow never to eat as much as the year before and every year I fail to do so. After laying on the couch in a food-induced daze for much of yesterday, I'm ready to eat my greens. As much as I swear off food the day of a big meal, repeating I'm never going to eat again! in a woeful voice to anyone who will listen, the next evening I still find myself craving something sweet. Perhaps this is the curse of having a sweet tooth. I've only gone early morning Black Friday shopping once. 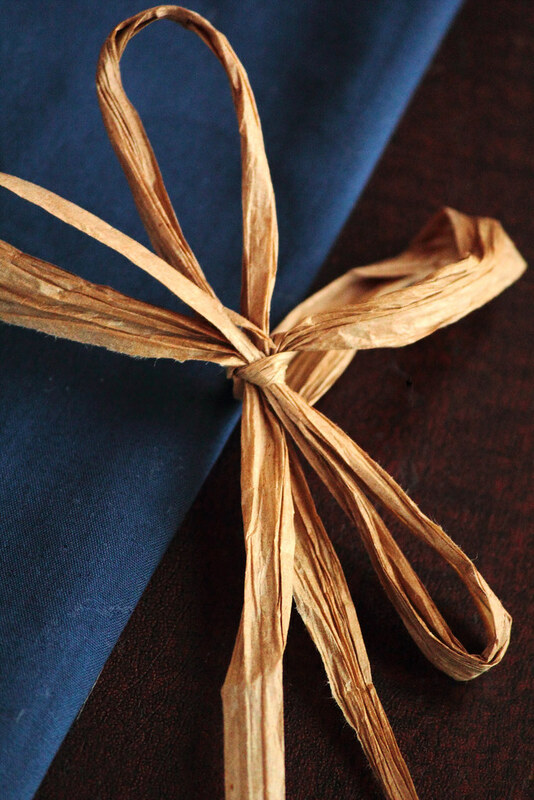 Since I'm a solid believer in giving homemade gifts, any supplies I buy aren't typically listed as doorbusters. I much prefer the warmth of my bed and waking up with the sun, enjoying a small breakfast before I head out shopping. I'm constantly amazed at how few people are left in the stores by nine in the morning. I get sleep, avoid crowds, and still manage to pick up a few things for myself. This is my version of Black Friday shopping. To satisfy my sweet tooth after a big holiday, I like to make simple, healthy snacks that will not make me feel like I need to spend another hour at the gym. Ideally I would like to avoid all sweets, but it is just not in my nature. 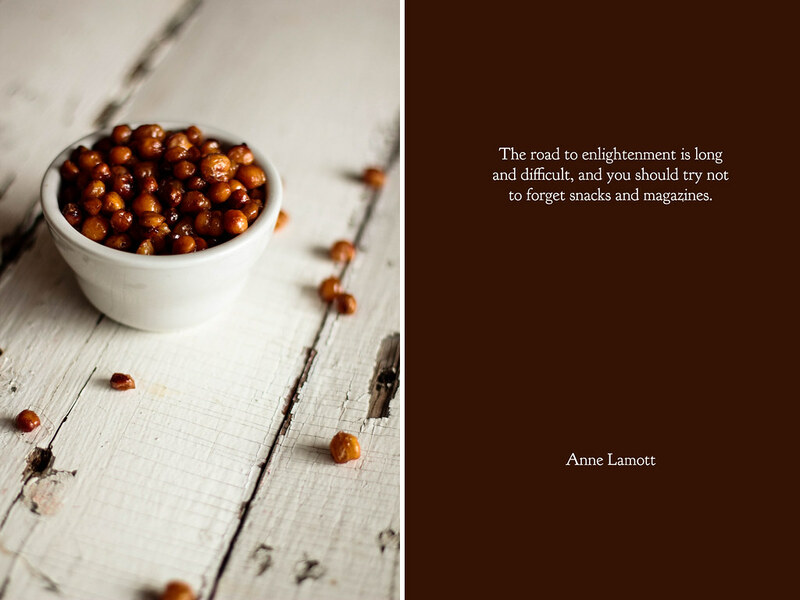 Turning healthy food that is typically served savory, like chickpeas, into a snack food makes me feel good about my sweet tooth. If I happen to eat the entire batch (as it has been known to happen), there is really no harm done. 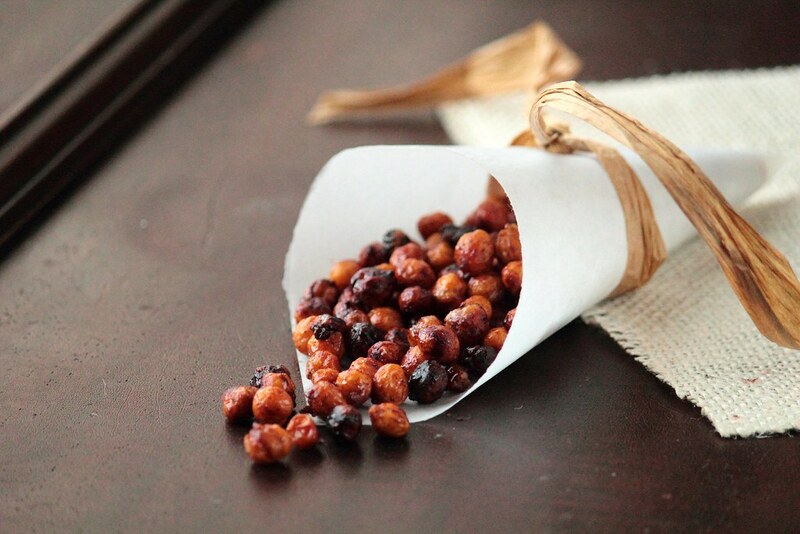 I already have a batch of these Maple Roasted Chickpeas stored away. I hope you enjoy this detoxing snack as much as I do! 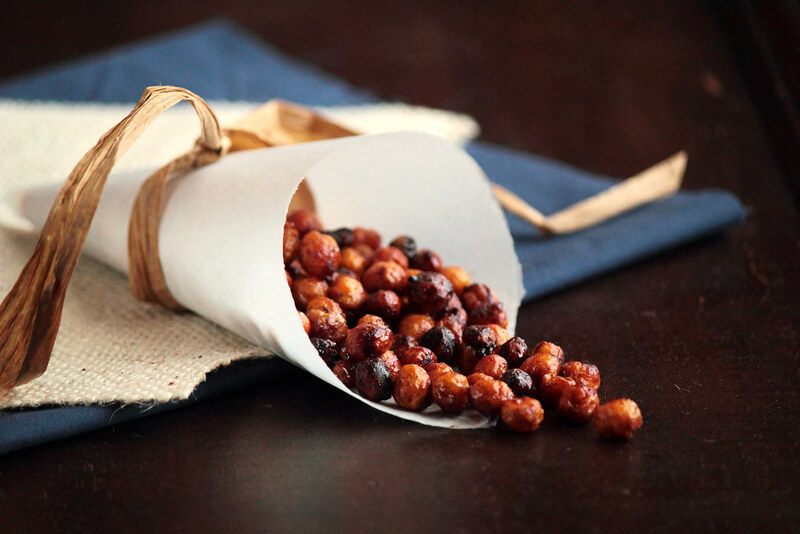 Maple Roasted Chickpeas are easy to make and easier to make disappear. Chickpeas are coated with a little oil, cinnamon, and brown sugar before roasting in the oven. Roasting transforms the chickpeas from soft beans into crunchy nuts. A little drizzle of maple syrup after baking adds sweetness and flavor (but not stickiness) to the final product. 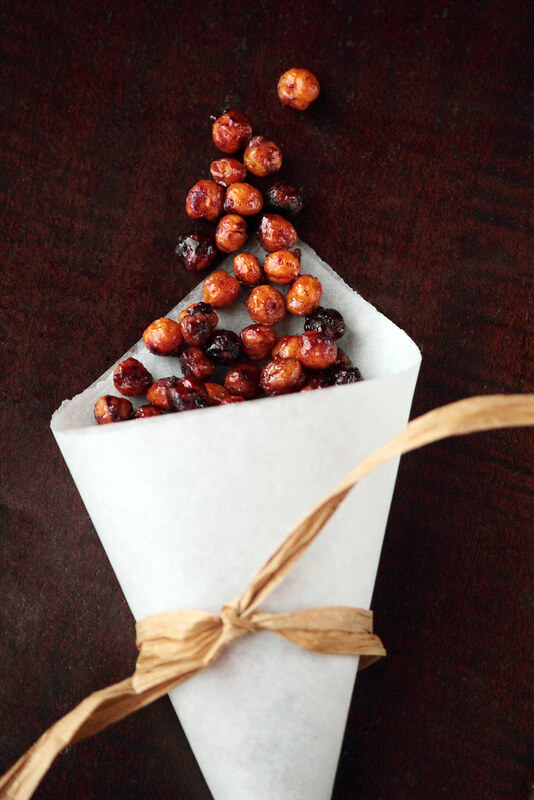 Roasted chickpeas make for a quick snack that is is healthy for you too! I very rarely pay attention to the nutrition of the recipes I share with you. Occasionally, I'll notice that something I've made has turned out unusually healthy, but it's always an accident (and never quite on purpose). I love butter, sugar, and heavy cream. I don't want to imagine my life (or desserts) without it. Despite my affinity for decadent desserts, I volunteered to develop a few healthy low-calorie, low-fat recipes for a local magazine. I thought it would be a cinch until I sat down to work out the recipes. It turns out it's a lot harder than I gave it credit for. What I thought would be a simple task became a new challenge, with one important question to answer. How do you remove the unhealthy ingredients of most decadent desserts and still keep them delicious? As I've been trial-and-erroring my way through recipes the last week, I realized something important. Maybe it's obvious, but it took me a bit to figure it out. I shouldn't have asked myself how to turn a decadent dessert into a healthy one. Instead, I should have been asking how I could turn a healthy food into a decadent dessert. As it so happens, starting with an already healthy food is half the battle. Or, in the case of these chickpeas, all of the battle. I've always associated chickpeas with hummus and little else. After a little research, I learned that chickpeas are so much more than just a bowl full of hummus. 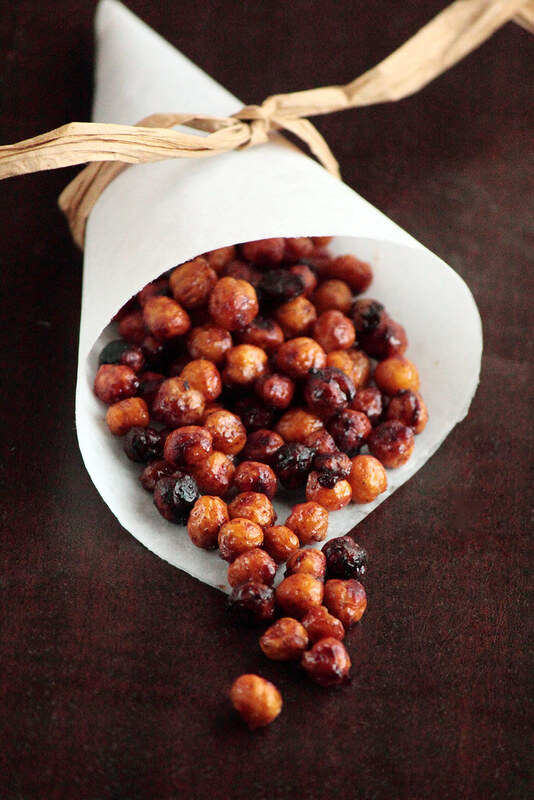 Roasting chickpeas in the oven turns them into something very similar to a crunchy little nut (but so much healthier!). 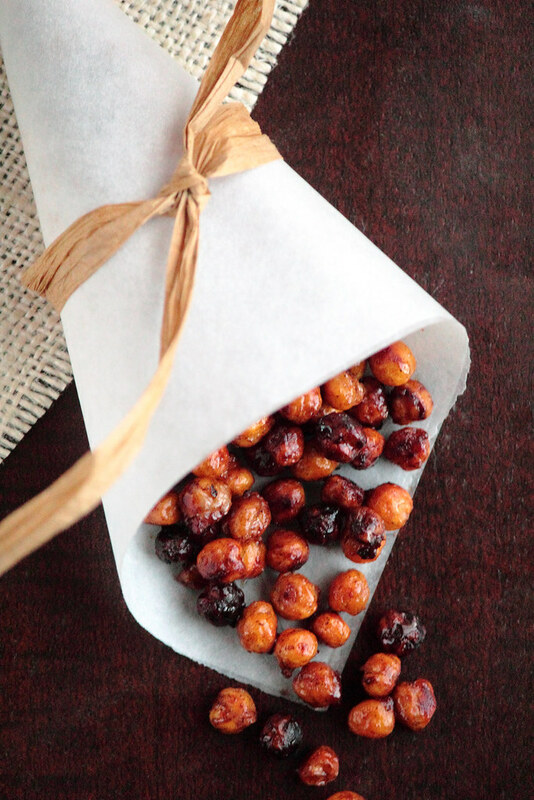 Since I love all things sweet, I added a little honey and cinnamon to these roasted chickpeas to make an amazing snack I pretty much devoured in one sitting. Though these little babies didn't make it into the magazine, it certainly wasn't because they weren't delicious or healthy enough. On the contrary, they were too good not to share with you immediately. I hope you make a batch of these for yourself. Finally a snack you can feel good about eating! 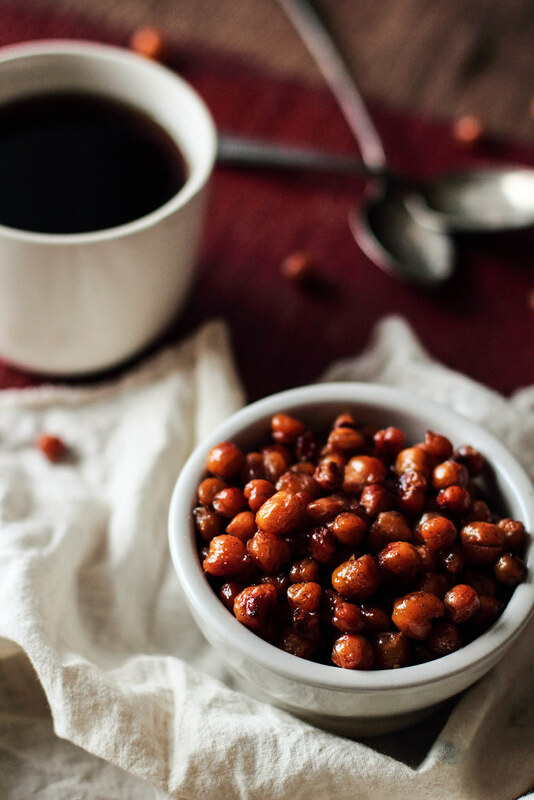 These Honey Cinnamon Roasted Chickpeas are simple to make, with minimal ingredients, and taste just like your favorite roasted nuts. 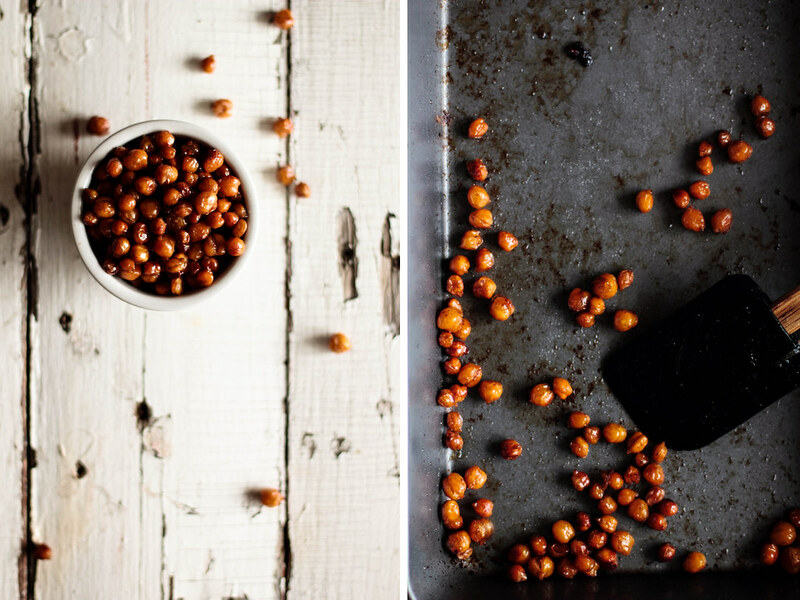 Roasting chickpeas turns them from a soft bean to a crunchy wonder. 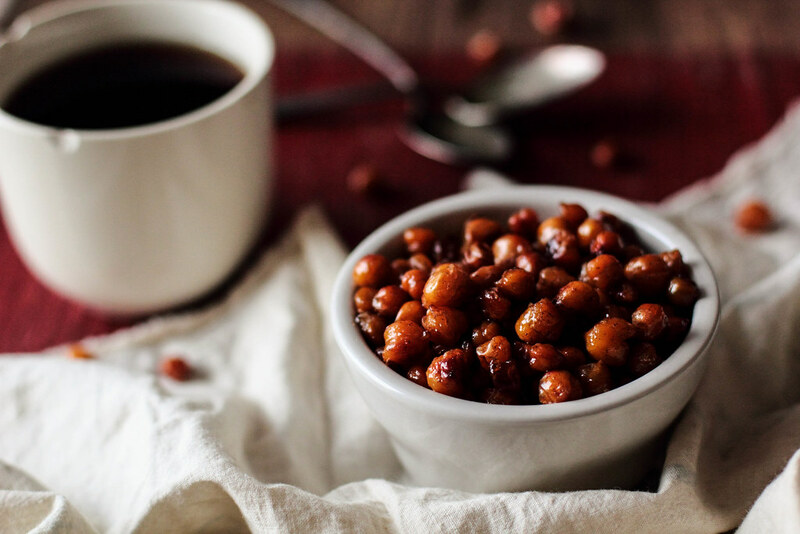 I added honey and cinnamon to bring a light sweetness and spice to these addictive roasted chickpeas. Fair warning: You might want to double this recipe right away. You can thank me later.